There will come a time, approximately 72 hours from now, that the thought of another piece of turkey will make you want to cry. The idea of one more bite of stuffing, or another mountain of mashed potatoes smothered in gravy, will make you groan in discomfort. I CAN’T TAKE ANY MORE GREEN BEAN CASSEROLE, you’ll think. And at that point, you’ll be thankful for this recipe – for something warm, comforting, and cheesy, that has NOTHING to do with a Thanksgiving table. It’ll be perfect to make on Saturday morning, and keep warm on the stove while you decorate the Christmas tree… and then to heat up the leftovers on Sunday afternoon, when you’re so burned out on cooking that you can barely even LOOK at food. Pick up the ingredients when you make that last run to the grocery store on Thursday morning, because you forgot chicken stock… you’ll be glad you did. *Two notes about the cheese. First: DO NOT use pre-grated cheese. 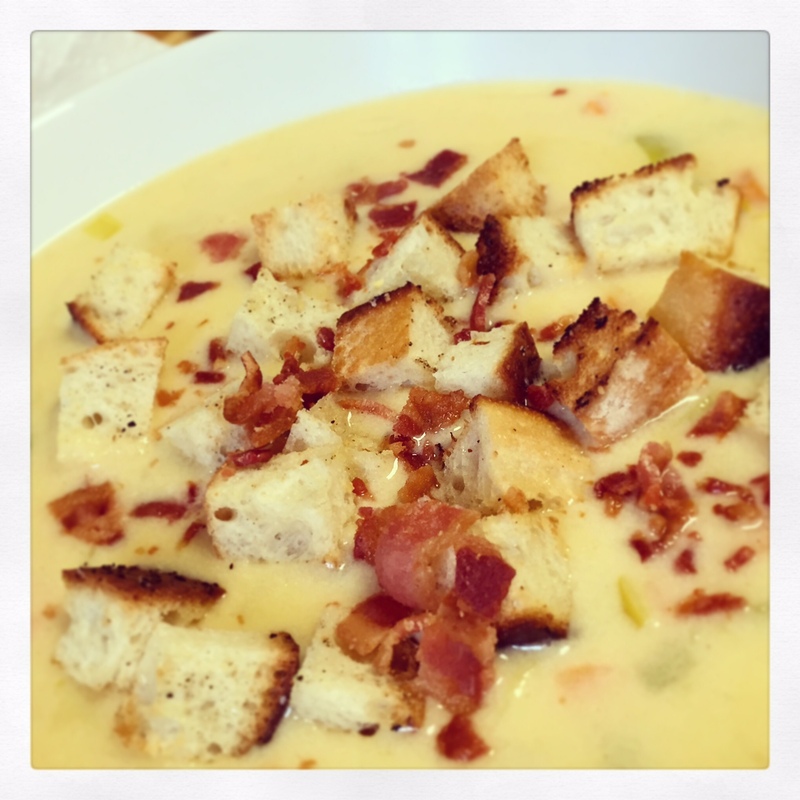 You definitely want to grate your own cheese for this soup, so you get a nice, smooth texture. 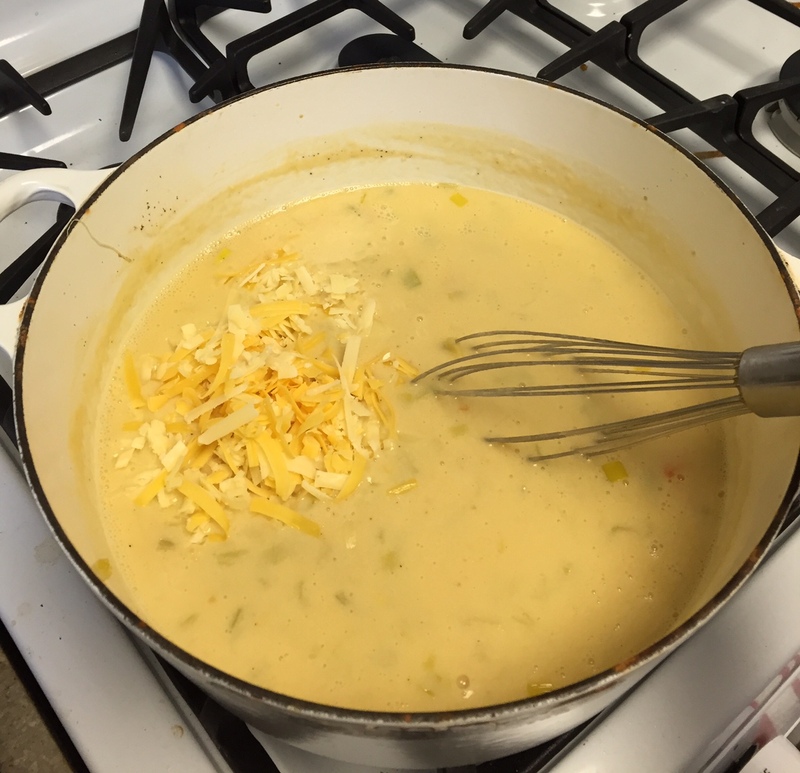 Second: if you LOVE sharp cheddar cheese, you can certainly use all cheddar cheese in the soup. I found it to be a bit too sharp for my taste that way, so next time I’ll make it with half sharp cheddar and half monterey jack, as indicated in this recipe. 1.) First, you need to clean your leeks. Grab a large bowl, and fill it 3/4 of the way with cold water. Cut the roots and dark green parts off the leeks, then cut them in half lengthwise. Cut those halves into 1/4″ thick half moon slices, and toss them into the bowl of water. Use your hands to break up the leaves and swish them around. Allow the leeks to sit in the water for about 5 minutes longer, without disturbing them. 2.) Heat a large pot over medium heat. Add the butter; once it has melted and browned just slightly, add the carrots, and stir to coat with the butter. Gently grab handfuls of the leeks from the water (being careful not to disturb the water too much), squeeze as much excess water out as you can, and add them to the pot. Discard the dirty water left behind by the leeks. 3.) While the vegetables cook, prep your croutons. Preheat your oven to 375°; line a baking sheet with foil, and add the cubed bread to it. Toss the bread with a couple teaspoons of olive oil, a couple good shakes of garlic powder, and a good pinch of kosher salt. Spread the bread into a single layer on the baking sheet, and bake for about 10 minutes, until golden brown. 4.) Allow the vegetables to sweat and cook down for about 5 minutes, seasoning with a pinch each of salt and pepper. Add the garlic and cook until fragrant, about a minute. 5.) Sprinkle the flour over the vegetables, and stir to coat. Let the vegetable and flour mixture cook for about 2 minutes, so the raw flour taste can cook out. Pour in the beer, and scrape the bottom of the pot with a wooden spoon, to lift any browned bits. 6.) Slowly pour in the milk and stock, whisking as you do. Once all the liquids have been added, add the worcestershire and ground mustard, and another pinch each of salt and pepper. Allow the soup to come to a simmer, and let it simmer til it thickens slightly, about 5-10 minutes. 7.) 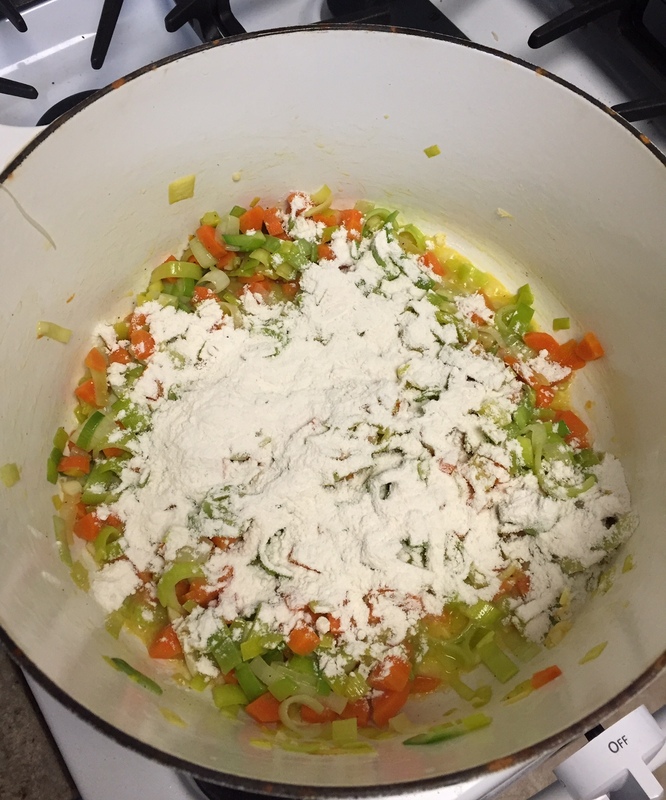 Turn the heat to low, and add the cheese to the soup in 4 or 5 batches, whisking each addition into the soup completely before adding the next. 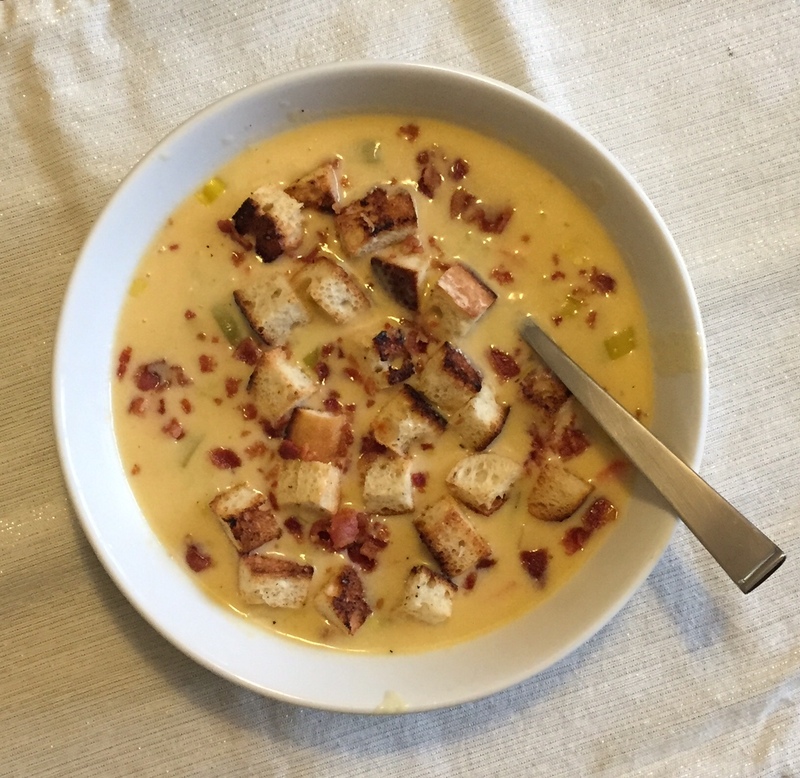 When all the cheese had been added, allow the soup to heat back through over low heat (about 5 minutes), and then serve topped with bacon and croutons. Not much better in life than a soup with an entire pound of cheese in it, am I right?? This soup is velvety and rich and cheesy, but somehow it manages not to be super heavy. The croutons add a nice crunch, and the bacon lends some smoke… and the cheese makes it cheesy, because cheese was sent to us directly from heaven, to make us happy, and so we should use it at every available opportunity. Or something like that. Either way, this soup is fantastic and super tasty, and it contains no trace of turkey or stuffing or cranberry sauce, so it’s the perfect way to reintroduce yourself to the world of non-Thanksgiving food. You’re welcome. Of all the weird, interesting, different foods I’ve tried to make over the years, one specific food has never appealed to me: sushi. I loooooove me some sushi for EATING… but learning to MAKE sushi has never sounded like much fun. I’m sure that one day, I’ll suddenly feel a need to make sushi, and I’ll run out and buy $50 worth of tools and supplies, and then come back here to declare to you how much I LOVE, OMG, LOVE making sushi at home… but for now, my sushi-eating remains in restaurants, where someone ELSE puts together my dinner. 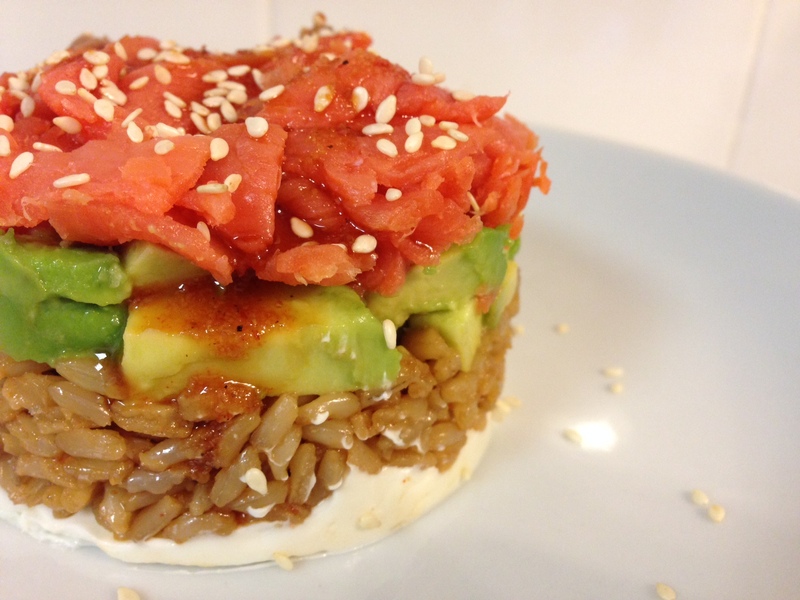 All that being said: this meal is really, really sushi-like, without 90% of the fuss. Last week, my mom and sister and I threw a wedding shower for a dear family friend, and when it was all over I had an extra package of smoked salmon left. I thought for a while about what to do with it, and eventually it lead me to the idea of a Philadelphia roll! 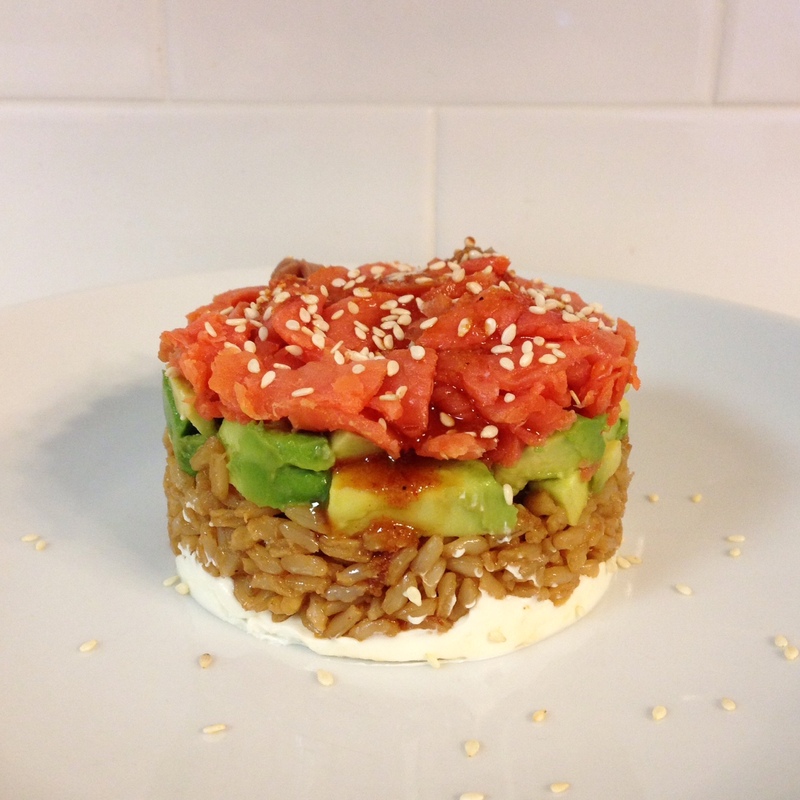 The Philadelphia roll is one of my favorites – smoked salmon, cream cheese, and avocado (though I’ve also had it with asparagus, on occasion). I figured that rather than rolling it up, I could just make it into a nice little stack, and it would taste much the same… and I was right! This dish is SO light and refreshing. I added a sauce to the whole thing, partially because I knew I had to incorporate soy sauce to give it a genuine sushi taste and feel, and partially because I wanted to add a little spice (a Philadelphia roll doesn’t typically have a spicy sauce in it, but this is the advantage of making my own rules in my own kitchen). I went to the trouble of making the presentation really nice, but it’s worth noting that my husband’s second and third servings (yes, he had three servings) consisted of all the ingredients piled on to a plate unceremoniously, and the taste was just as fantastic. *To make these neat and pretty stacks, I used a 3″ biscuit cutter to layer my ingredients into. You can certainly use a cleaned tuna can with both the top and bottom taken off, or another shape of cookie cutter, or just stack everything together all willy-nilly. Your taste buds won’t know the difference, I swear. 1.) Start by cooking your rice; I always use the 90-second microwave bags of rice, because they’re quick, easy, and I don’t end up ruining an enameled cast iron pot by burning the rice (not that I’ve ever done that… RIP Martha Stewart dutch oven). While the rice cooks, whisk together the ingredients for the sauce: soy sauce, sriracha, mirin, rice wine vinegar, garlic powder, and a small pinch each of salt and pepper. Feel free to add more sriracha to taste. While the rice is still warm, pour about 2/3 of the sauce over it, and stir to combine. The warm rice will absorb the sauce as it sits. 2.) Toss the sesame seeds into a dry pan over medium low heat, and toast them until they’re lightly golden brown and fragrant. Set aside. 3.) For each serving, spread one ounce of cream cheese as the base. 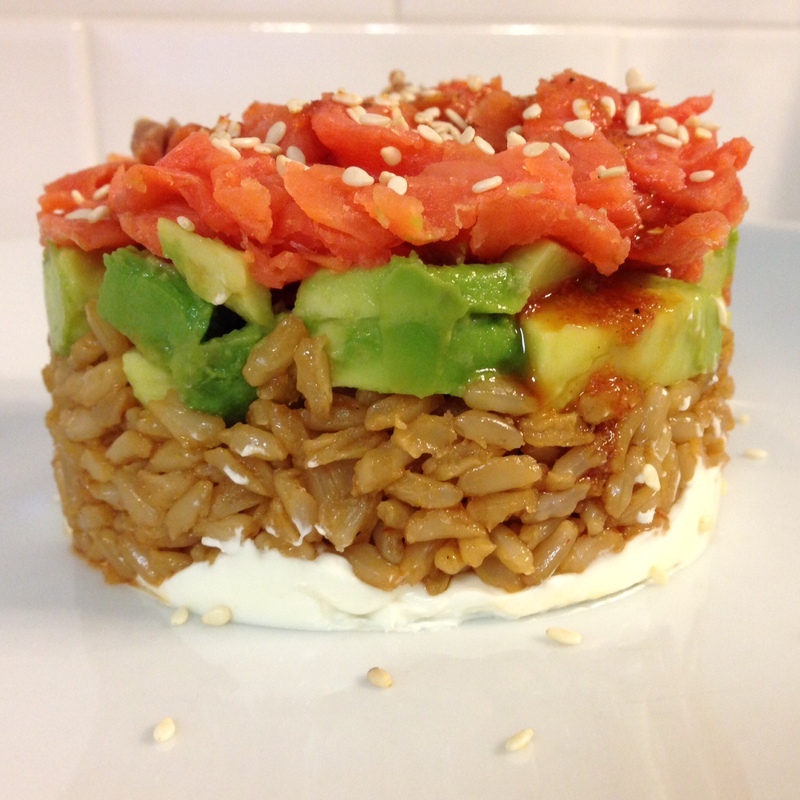 Top with half a cup of the brown rice mixture, then half a diced avocado. Once you’ve added the avocado, sprinkle that layer with some kosher salt – don’t be shy, the avocado really needs the salt for optimal flavor! Finish with an ounce of diced smoked salmon, and a sprinkle of toasted sesame seeds. Feel free to add more sauce, if you’d like. Serve immediately. Yeah, so, we’ve already agreed to put this one on a regular rotation. It’s just so good – and so EASY! It really took about 10 minutes to make, and that’s because I was insistent on making it into a neat, fancy stack. It’s super filling (one stack made a great dinner for me, though I’d add a simple green salad on the side next time), and also really healthy – good fats, lots of protein, whole grains. I mean, what’s better than a dinner that makes you look like some kind of fancy rock star chef, because the presentation is so pretty, but also allows you to feel SUPER SMUG about how health-conscious and virtuous you are?? Win-win, my friends. 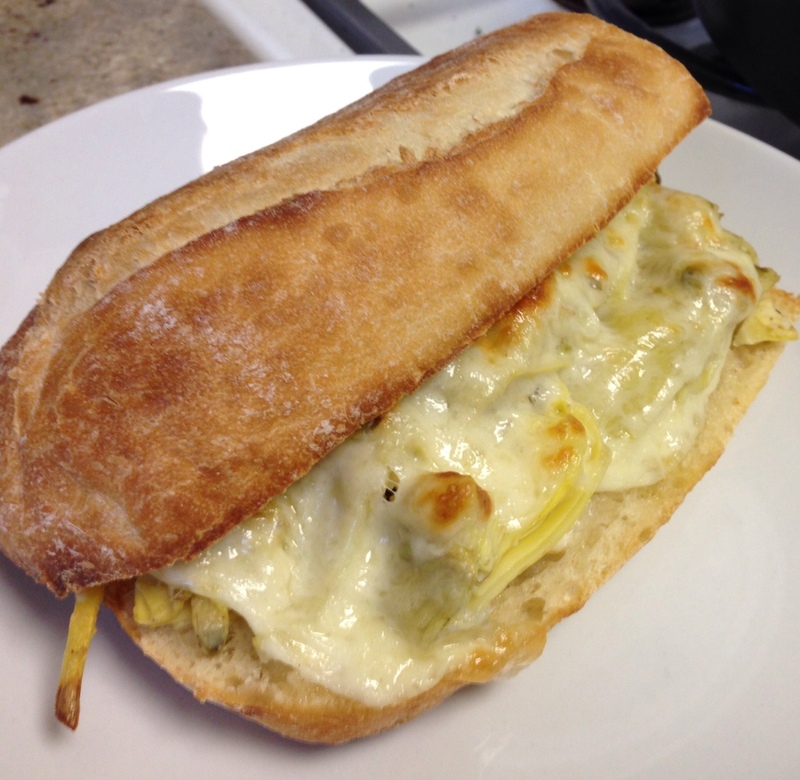 Please note: you could also leave the top of the bread off this sandwich, cut the cheesy artichoke bread into 2″ pieces, and serve it as an appetizer. Versatility! *In general, I prefer a baguette with a good, crisp crust. However, for these specific subs, I like to look for a baguette that’s slightly softer. Since we’re baking the subs, the exterior will have plenty of time to crisp up – and if you’re starting with a baguette that’s already pretty hard, the roof of your mouth will get destroyed as you try to enjoy your dinner. Just my 2 cents. 1.) Preheat your oven to 375°. Drain the canned artichokes well, and then lay the artichokes in a single layer on some paper towel to drain further; water gets trapped in between the leaves, so you want to make sure to get rid of as much of that moisture as possible to avoid having a soggy sub! 2.) Heat a non-stick skillet over medium heat. Add the olive oil and butter to the pan, and once it’s hot, add the artichokes. Season the artichokes with a pinch each of salt and pepper, the red pepper flakes, and the dried oregano. Stir until everything is well-combined, and then leave the artichoke mixture alone for a couple minutes, so they will start to crisp and brown a bit on the bottom. 3.) Once the artichokes have started to brown nicely, add the grated parmesan, and stir well. Let the artichokes cook another minute or so, and the parmesan will start to brown and crisp a bit, too. 4.) While the artichokes crisp up, make your mayo. In a small bowl, mix together the mayo, lemon juice, and grated garlic. If you don’t love the taste of raw garlic, you can cut this back to one clove, or use a dash of garlic powder instead. Set the mayo aside. 5.) Slice your baguettes in half, leaving the “hinge” intact on the back side of the bread. I like to scoop out some of the bread from the interior of the baguette to make adequate room for artichokes (and as a bonus: the interior of the bread is excellent in a kale panzanella salad). 6.) Spread the bottom of each baguette with the garlic mayo, and top with half of the artichokes. 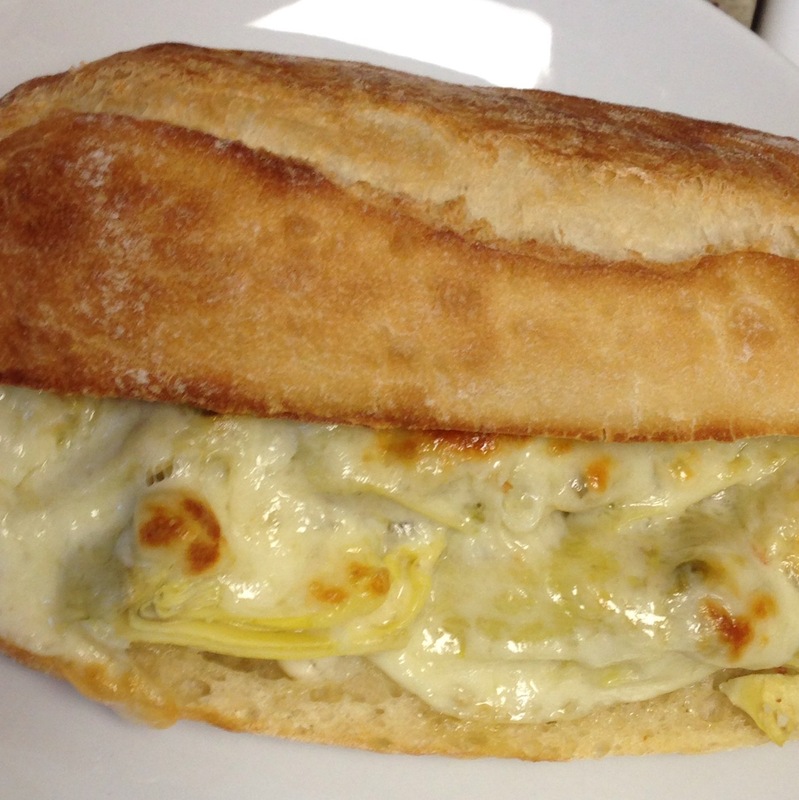 Lay the provolone slices over the top of the artichokes, and bake the subs for 10-15 minutes, until the edges of the bread are golden brown, and the cheese is nicely melted and browned. Serve immediately. I mean… seriously. These subs are so cheesy, and gooey, and delicious! And despite being meatless, they still feel and taste hearty and filling, because the artichokes are pretty meaty (as vegetables go). Crisping up the parmesan in the pan adds just a bit of nutty flavor, and the lemon in the mayo lends a little acid to cut through the richness of the cheese. In recent months, we’ve had these subs for dinner at least once every 10 days or so – paired with a salad, or some roasted chickpeas, or some variety of roasted vegetable. Fast, easy, and satisfying. I am not typically a big lover of watermelon. 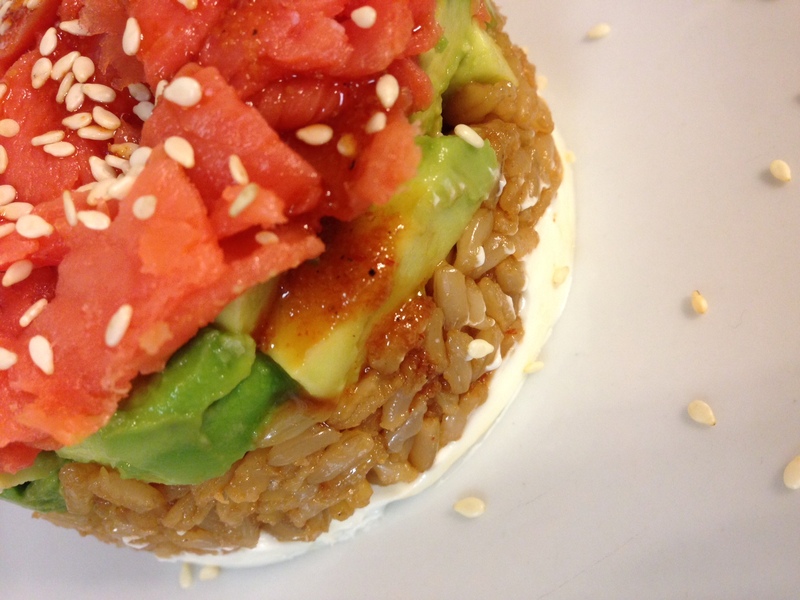 Every summer, I see people getting so excited when the season for good watermelon rolls into town, and I think… “Eh. It’s just… watermelon.” It’s just never gotten me real excited. *All this means is that you should stack up the mint leaves, roll them up into a little log, and then slice the log into 1/8″ to 1/4″ wide pieces. This will give you lots of pretty little ribbons of mint! 2.) 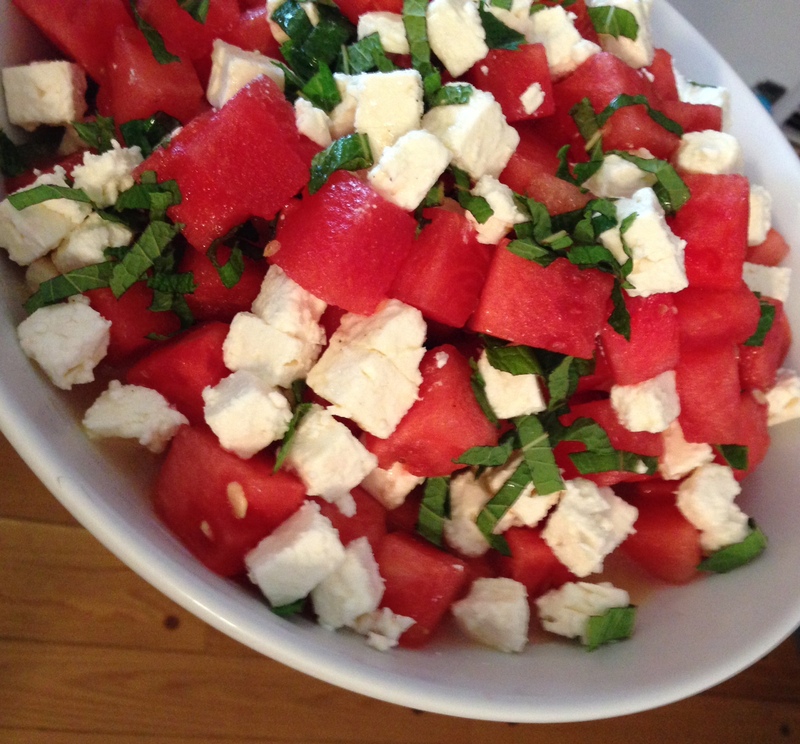 Take a large, wide serving bowl, and put about half the cubed watermelon in the bottom. Top with half the feta, and half the mint. Pour 1/3 to 1/2 the dressing over the top (you may not end up using it all), and then make a second layer of all the ingredients. Serve immediately, or cover the bowl and chill in the fridge for up to 2 hours. You could certainly toss all the ingredients together, but layering them keeps the feta from breaking up too much and making the whole salad look a little murky. It looks beautiful once it’s all put together – and tastes just as great! 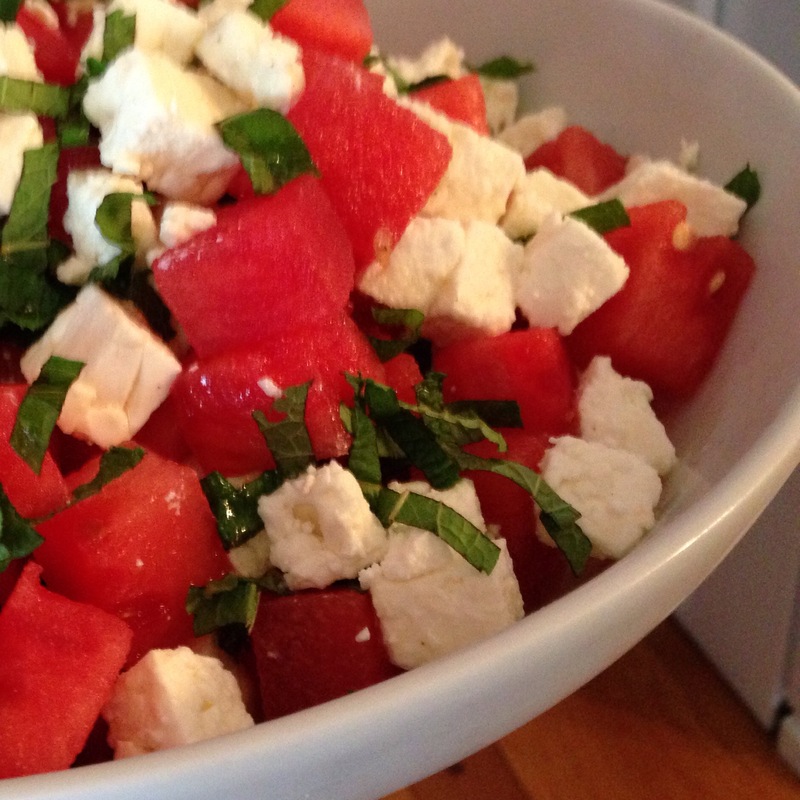 This salad is wonderfully refreshing, and the sweet/salty combination of the watermelon and feta is fantastic. Of course, this salad would be perfect for a barbecue or outdoor party. If you want to make it ahead, I would just dice and chop everything ahead of time (as well as mixing up the dressing), and then layer it right before serving.